Pakistan vs World XI: The live streaming and live cricket score will be on PTV Sports, DSports, and CricketGateWay.com. Here’s how can you watch cricket match online along with today match predictions & preview. Here’s everything you need to know including the squad, schedule, playing xi, and much more. Both the teams are going to play the first of three T20 cricket matches today. It marks the return of international cricket to Pakistan after a long gap of 8 years. Last time, Sri Lankan team visited and witnessed a terrorist attack on them in Lahore. World XI team is lead by South Africa’s Faf du Plessis. The second T20 game is scheduled to be played on September 13, tomorrow. The third and final twenty20 will be played on September 15, 2017. WorldXI squad includes world class players like George Bailey, Hashim Amla, Imran Tahir, and Ben Cutting. All of the three cricket matches of this Independence Cup will have a live broadcast. If all goes well in every respect especially security, then Sri Lanka and West Indies teams will also visit Pakistan in the coming months to play T20Is. It will start at 7:30 pm IST at at the Gaddafi Stadium, Lahore. Commentary and ball by ball updates will be announced by Wasim Akram, Waqar Younis, Rameez Raja, and former Zimbabwe Medium Pacer, Pommie Mbangwa. ICC WorldXI: Faf du Plessis (captain), Hashim Amla, David Miller, Morne Morkel, Imran Tahir (South Africa), Samuel Badree, Darren Sammy (WI), George Bailey, Tim Paine, Ben Cutting (Australia), Grant Elliott (New Zealand), Thisara Perera (Sri Lanka), Paul Collingwood (England), Tamim Iqbal (Bangladesh). 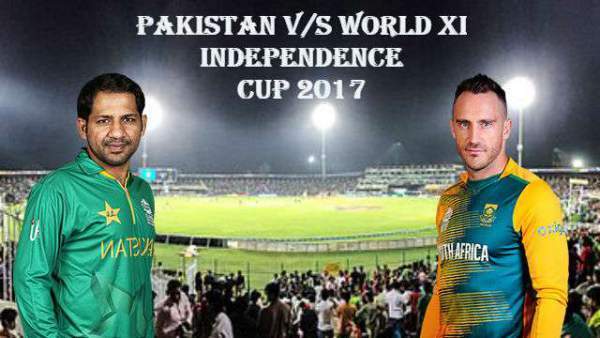 Come back for Pakistan vs World XI live streaming, live cricket score, commentary, ball by ball updates, match result, highlights, scorecard, and much more.